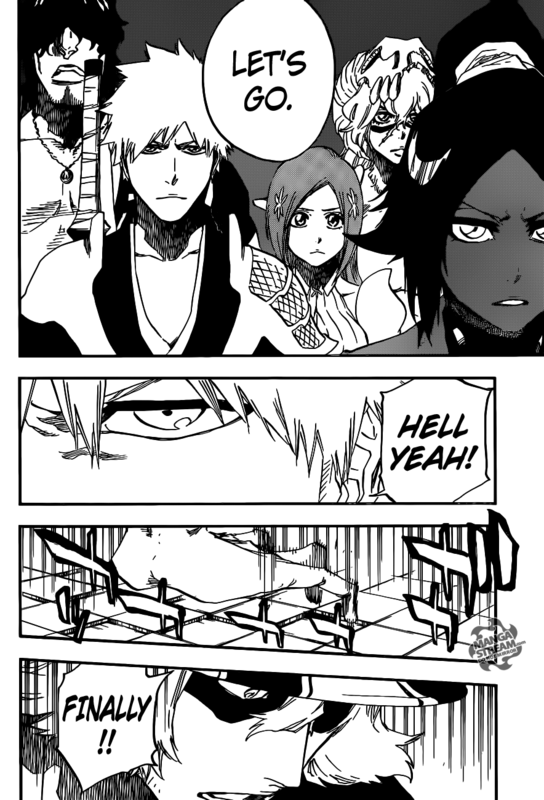 Ichigo and his friends prepare to face off against Yhwach. Yukio surprises everyone when he tells them “that he does not intend to leave the box when they arrive“. Ganju is outraged, he points out “that everything will disappear if they lose, but Ichigo merely tells him to stop before agreeing that Yukio should stay here“. 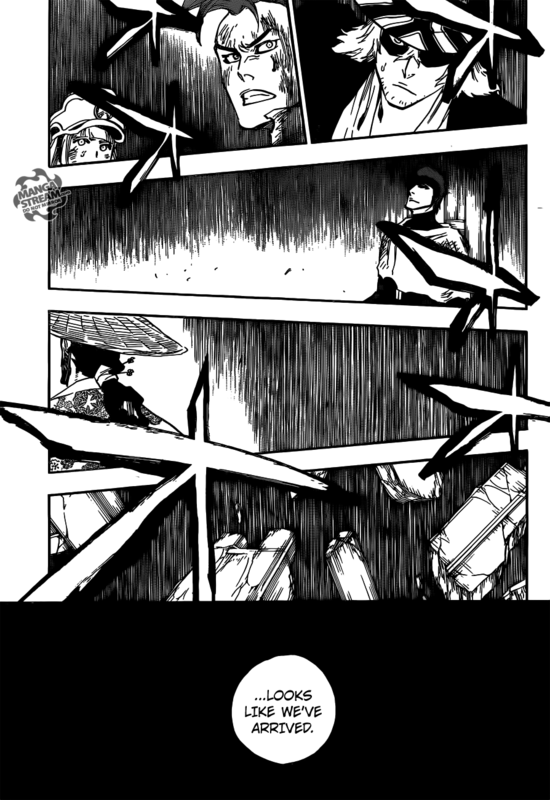 Ichigo tells Riruka to “stay here as well because her powers will only make the battle more dangerous”. Ichigo thanks her for “keeping the Valley of Screams“, she stays even though she is reluctantly to do so. 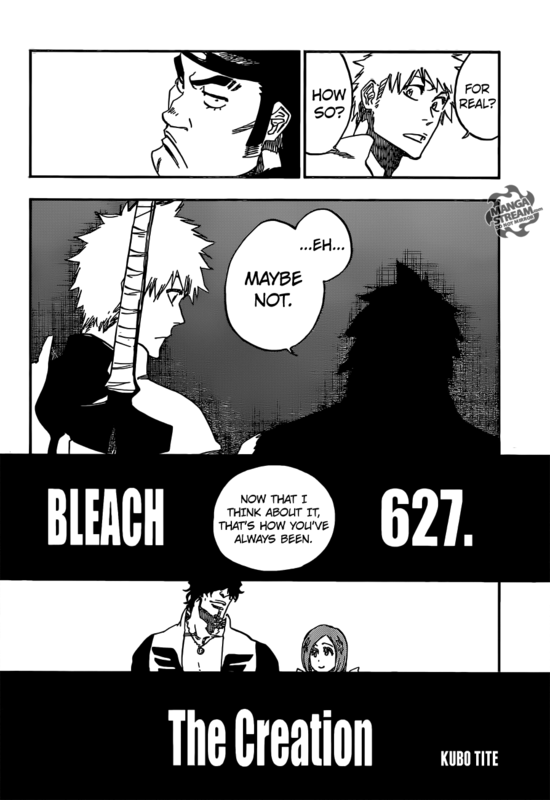 Ganju notes the Ichigo “has matured“. Meanwhile, in the Seireitei, the buildings in Wandenreich city begin to crumble. The Shinigami are surprised whats happening, Shinji Hirako expresses anger that the Quincies always seem to change the situation before they can act. Urahara notes that the gate is completed to the . Yoruichi informs the rest of her group that they have arrived. Urahara announces the completion of the doorway, as Ichigo looks through the Garganta to see the Wandenreich city. The landscape of Wandenreich has changed, but Yoruichi sees the stake marking the palace remained. She realizes that, Yhwach has changed the palace. Chocho is happy to see that Naruto, the Seventh Hokage, has arrived to rescue them from Shin Uchiha. Shin activates his Mangekyo Sharingan and attacks Naruto with a kusarigama, Naruto blocks this attack with chakra arms. Kurama tells Naruto that its, “about damn time, he let loose“. 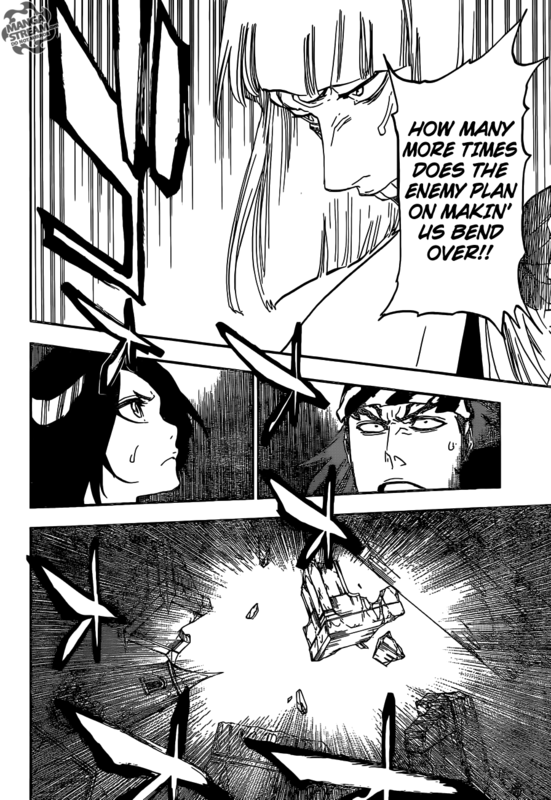 Naruto attacks Shin, but he dodges to Naruto’s praise. Shin retreats, using dimensional transportation. Naruto tell’s the girls to continue traveling with him as it’s safer. Sarada denies Chocho’s assumption “she was the target”. Sarada gives Naruto the lunch box that Boruto gave her. During lunch, Naruto tells Sarada about her father in stories that are “skewed” in his favor. Naruto tells her that Sasuke was his rival, she feels comfortable with Naruto. They approach a temple to meet Sasuke, Chocho collapses due to exhaustion and decides to get some rest. Sarada lies to Naruto, telling him she needs to use the restroom. She awakens her Sharingan and enters the temple excited to meet her father. However, Sasuke doesn’t remember her ad draws his sword at her, asking if “she’s affiliated with Shin“. Sabo kicks Jesus Burgess in the back who declares that “he will be the one watching Luffy’s back“. Burgess realizes that Sabo and Lucy are one and the same. 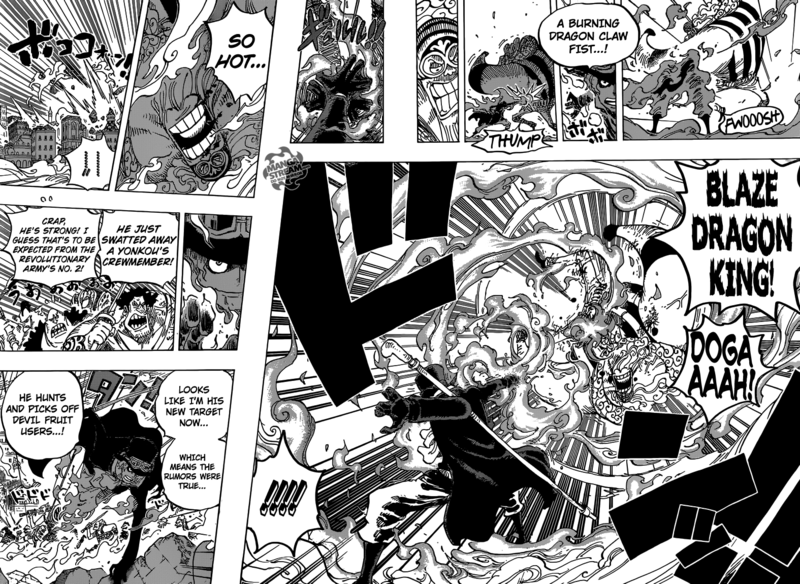 Burgess begins to attack Sabo, claiming that he will take the “Mera Mera no Mi” from him. Gatz carries Luffy to safety. The gladiators facing Doflamingo are easily defeated, he calls for Luffy to “show himself“. The citizens continue fleeing as the cage shrinks, Zoro and Franky attempt to destroy the birdcage. The gladiators who fought against Donquixote family are healed by Mansherry. Doflamingo, speeds up the Birdcage resulting in “only three minutes” being left even though Luffy still needs four minutes to recover. I think you should start, its a really good series. I’ve started the anime, I’m on when Usoop is about to get recruited.